I have been a busy fangirl. I ‘bumped’ into Jay Shetty on my way back to my desk after lunch at work. You can google him now. I have been following Jay for a few years, and his content is inspirational but what I find quite remarkable is his ethos about stepping outside of your comfort zone and perspective. Over the last few weeks, I have been attending events and having naughty post-event blowouts. The calories gained will be burned off when I start training for the Royal Parks Half Marathon that I am running for the Taylor Bennett Foundation. I headed to Twickenham for the Employee and Engagement Conference London. There were some recurring themes throughout the day as the award winners presented their campaigns. • Use of data and insight to inform internal communication and employee engagement strategy. • Solving the mental health crisis. • Implementing Workplace by Facebook. Barriers for adoption and the success stories UNICEF and lastminute.com. • Reinventing recognition schemes in the public sectors with limited budgets. There were a few presentations that stood out from Ryan from Hive and Kate from Beyond. • How to use survey tools to manage change and create effective questions for engagement. • Overcoming cultural challenges when embedding new HR technologies. • Moving from annual surveys to ongoing feedback for a more meaningful employee experience. Businesses have now realised that the more they spend on development and employee experience the better the customer experience will be. Why aren't we getting employee engagement right? We seem to be missing critical insights provided by data. Some businesses are now trailing a metric that focuses on ‘Are you having a good day?’ This is a measure of physical and emotional energy. • The employee life cycle. • How data is used to craft a narrative to justify the organisations' objectives. • The truth behind response rates and whether the data can be trusted if incentives are attached. • An understanding of the current organisational culture and subcultures. Because introducing new technology doesn’t change a culture. • Real thought and time to test new initiatives. Thinking differently about our people, diversity and inclusion initiatives, agile evangelist and total wellness. A great example of cross-agency collaboration through Flipside which tackles socio-economic diversity. I went to my first Sharing Social London Event at Runway East. The theme of the meet-up was audience intelligence - what is it and what can you achieve with it. Having data and insight about audiences is something that is becoming more important as the competition for attention gets tougher. How then does a brand or organisation extract value from existing data and make that a base for their strategy? The two speakers shared best practice and tips on how to get started. Emily McReynolds, Passion Digital - How can social analysis be used to inform decisions? · Start with what you have. Social listening, brand sentiment, existing audience intelligence, historical data and trends analysis, competitor data, and previous campaign data. · Develop questions that guide your data analysis and don’t look for the answers that you want. · Insights can inform more than messaging and tone of voice. Effective use can also help with making decisions on media spend, product and service opportunities. Ben Davies, Media Chain - Gaming The System: An exploration into the world of gaming and social media. His talk was based on the report Gaming the system? An exploration into the world of gaming and social media. · Create a map of what insights and data you are looking for, i.e. Demographics, lifestyle, spending power, social habits, media consumption patterns, and interests. · Brands should build and enhance experiences instead of invading spaces. An example of a brand that has already done some great work in this area is Mercedes-Benz. · The key is value, content and community. Check out Media Chain’s research and insight reports into Black Friday & Cyber Monday 2018 partnership opportunities and Navigating the next generation fan: How football is social. I will be keeping an eye on their work as we gear up for the Rugby World Cup in September. I've been reviewing themes and examples from the recent Adobe Experience Festival. The Always On, Always Personal, Always Relevant session by Matthew Harwood, Head of Digital Solutions, Royal Bank of Scotland was a snapshot into how RBS transformed the way they think about their business. It is not only about technology and data, but people & process have also been essential to their success. · More timely, more relevant and a better understanding of the customers has better results. · Spend as much time as possible with frontline staff, and build a closed-loop of feedback. · Bring the customer experience to life. In banking, a customer connects with buying a home rather than the process of acquiring a mortgage. · As channels change and your strategy evolve there is a need for the ecosystem to grow too. Check out Data and research in PR by Claire Simpson as it’s a great place to start. 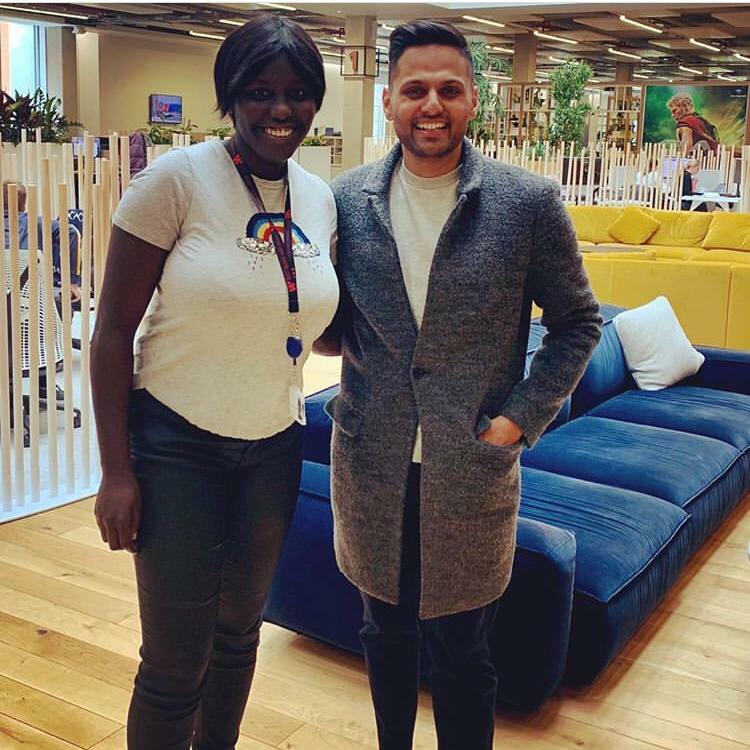 I recently did a talk and panel at Wework South Bank called The easy way to build a personal brand for Outreach Digital a group that I volunteer for, and that is actively developing the digital and marketing community in London. I hope the resources, books, podcasts, websites and information I provide in this Presentation help you.